There's a little more to this hand than only the history for me personally so I hope you can forgive me if I share a little story first. I'd appreciate it a lot if you could read it but if you're only here to help me out with this hand I'll do you the favour and wrap it into a spoiler. I'm playing and studying Poker for more than a year now and I just can't seem to be winning. Don't be afraid, this is not going to be a whiny post. I really only started to feel confident in what I'm doing at the tables after I finished CORE here, which is an amazing course that I loved. I took around 200 pages of notes. I always played very few tables, 2 or 3 at max, to be able to analyse situations and apply my new knowledge not only during off-table studies. Finally it seemed like I was winning and enjoyed the game so much more. But I was also fully aware that my sample size was nothing to draw any conclusions from and that I really needed to get a bigger volume to finally be able to judge my skills. So recently I've added an additional table and I'm now at 4. I sometimes realise I miss some details but overall I think I can handle it quite well. I'm working full-time but I try to play at least 400 hands when I get home (about 1-2 hours) and analyse at least 1 hand a day. Now here's the frustrating part: Since I'm playing 4 tables, I started losing big. I lost nearly everything in 2k hands that I spent 5k hands building up. Due to my sample size I am aware this could simply be a downswing, but I don't want that to haunt me as a cheap excuse. I don't know how to determine that effectively without analysing every losing hand and I don't have the know-how to do a good DB analysis but it mostly seem to be hands like the one I chose that drag me down. I picked this hand as an example for many others that are similar. PREFLOP: I know the raise sizes are small but I believe the BB to be a decent player who would 3bet a lot to defend and I wanted to get called by hands like QQ-TT, AT+ and KJ+. FLOP: I bet around half pot on the flop which I think is fairly standard for a small-ish 4bet pot. Since I have 72% equity against a range like QQ-TT,ATs+,KJs+,ATo+,KJo+ (assuming KK+ would 5bet preflop), and 58% equity against a calling range like JJ,AKo,AJo,KQo-KJo,AKs,AJs,KQs-KJs (TP+), this seems to be a clear value bet. TURN: The turn is a brick card because surely villain would not have ended up here with 55. The only thing it might do for him is open a flushdraw. I bet again and villain shoves, giving me 17% pot odds. Even though I know turn raises are statistically most likely sets+, could I get away from this hand with the price I'm getting? Assuming villain might shove any JX hand he ended up here with (JJ,AJo,KJo,AJs,KJs), my equity against this range would be 3.3%. However, I think it's not unreasonable to assume that he would also shove AK in order to not end up with a weird stack-size on the river, which would boost my equity to 35%. Should I have bet smaller on the flop and turn to get away more easily? Should I be more reluctant to call turn raises with "only" top pair in these situations? I did assume to be ahead a large chunk of the time, so I tried to get the money in. Should I have been more careful here? All I know is that something is dragging me down and so far I just could not figure out what it is (related to the story above). yes, too small. you dont want to 4bet smaller with AA because you want calls from weaker hands. would you also 4bet smaller with your bluffs? dont just think about your particular hand but about your range here. if he actually 3bet/f QQ to your 4bets, you are printing rakeless money big time. just because you are ahead equitywise doesnt automatically mean you can bet in general. if he actually 3bet/f QQ to your 4bets, you are printing rakeless money big time. I'm not expecting him to fold QQ, I hope he 5bets or calls with them. However I'm expecting him to fold a lot of his merged hands that he should have as he should 3bet a lot in the BB vs a BTN open and I don't think he'd continue with those against an ordinary 4bet size. would you also 4bet smaller with your bluffs? 4betting smaller was my attempt to think outside the box and it was an exploitative move so I don't think it makes sense talking about balance here, aka which bluffs I would 4bet smaller. The SPR on the Flop is about 2.5, which is usually a default stack-off with TP+. Thus I'm thinking about how to get the money in and I'm not really concerned about with what I have left on the river. As I understood it the SPR is not re-evaluated on the Turn as it is a Preflop/Flop metric only, to determine commitment. I don't think a hand like 99 would call a 4bet, and even if it does I don't think villain would continue on a Flop like this ever unless I bet ridiculously small. So I don't give that scenario much thought either. My equity against villain's continuation range is >50% which makes it a value bet. I deny equity for gutshots like AT or AQ, as well as for the outs he may have with KX hands that could improve him to 2pair or a set. With an SPR of 2.5 it seems the money will be going in regardless. Combined with the fact that I am in position I think these are enough reasons to apply pressure and cbet in this spot. I invit you to dig deeper into the flop, both on the action and the sizing. So judging from that comment I assume you suggest that I made a mistake on the Flop? I don't believe there's much useful information to be gathered from the action here but I'm happy to be proven wrong. The BB checks which seems default, checking to the previous street aggressor. Check-calling doesn't give away much either other than that he's hit something. There are about 18 combos of TP that I beat and 11 combos of trips+. Unless I believe he would not call with KQ here. That might be one mistake, thinking that he does call wider than he would. My plan was to 4bet smaller so that he villain makes the mistake of calling too wide, being faced with an unusual 4bet size, so I assumed if he called and did hit TP with KQ he would not simply fold. On the other hand this hand would play very uncertain OOP with second kicker in a 4bet pot. Let's assume I check back AA to strengthen my checking range with one of my strongest hands that isn't too likely to get dominated by a turn card. It would also make sense since TP isn't exactly 3 streets of value. In that case villain would most likely probe bet the turn and I'd pretty much always have to call. On the river he's very likely to bet again and then my call would sort of depend on the size. I could use Flopzilla to determine what hands he would bet the river with again (likely most hands as he would probably want to set his own price and comfortably then fold KQ if I were to raise), and compare my equity to the odds I'm given in the most basic way. And if I was to bet the Flop, I might size it smaller to get KQ to come along. You have to ask why betting, with what range, and how much - to realize your goal. And anticipate V's reaction (action and range). But before that, you need to put Villain on a range. For example, does he 3bet KQos ? When he faces a 4bet, does he call OOP with KQo ? 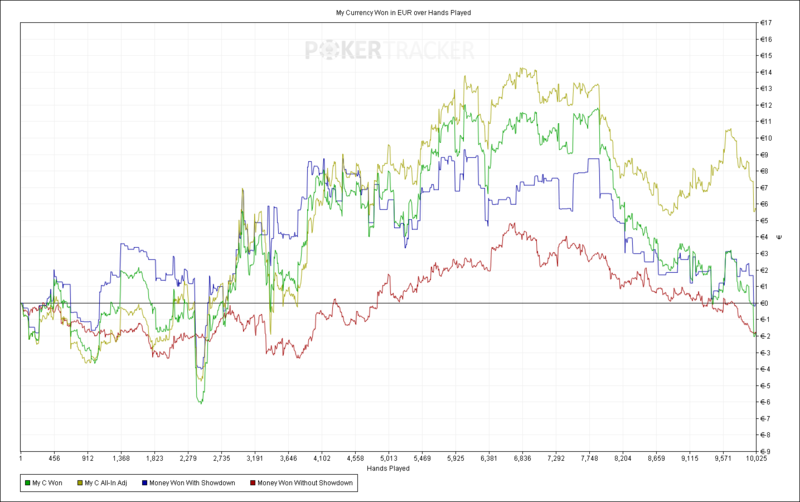 So first, play with flopzilla/equilab/other, and put a range down for his 3bet/call range. I did all that as evident in either my original post or my first comment. I'm listing ranges, equities, reasons to bet, everything.